Without Santini, Men’s Soccer Team Will Retool in Quest for National Prominence | The Gettysburgian. 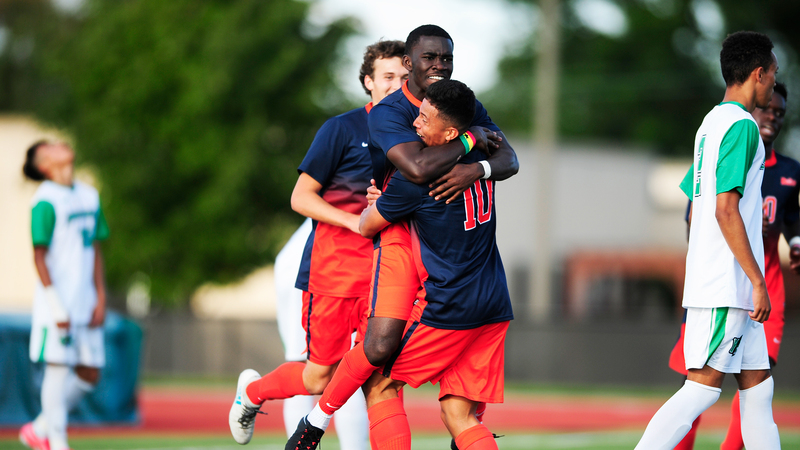 The Gettysburg College Men’s soccer team is coming off a successful 2017 campaign in which it went 13-5 (7-2 CC), racking up the most wins of any season since 2001, while just missing a berth to the Division III National Tournament. The team begins the season without a key asset: Patrick Santini, who graduated in May. Santini was voted Centennial Conference Player of the Year and recognized by United Soccer Coaches as a first-team All-American. Santini led the conference with 20 goals, including a torrid stretch where he rattled off 10 straight goals over six matches. In 2017, Lerman finished second on the team with 11 points, the most by a freshman since Eric Hynes ’12 had 17 in 2008. He also led the team with 5 assists. Molina, who missed the end of the year with an ankle injury, also showed promise, racking up 2 assists in their win against nationally-ranked Haverford. Gettysburg’s defense ranked second last year, holding opponents to .93 goals per game. Keane, who started 9 matches last year, will take over as the goalie to start the season. Keane is coming off a strong year where he was in the top 4 among Centennial goalies for goals allowed and goals per game allowed. Last year, Gettysburg suffered a 1-0 defeat to Franklin and Marshall in the Centennial Conference semifinals and failed to receive an at-large berth to the Division III NCAA Tournament. Keane said the experience gained and the motivation from not making the tournament last year has led to great team energy and focus to win the conference and move on to the National Tournament. Both Keane and junior midfielder Precious Ozoh praised the preparation the team has done in the offseason to get ready for this year. They said the strong workout program, created by new assistant coach Michael Kovach, which incorporates rotating days of timed runs, weightlifting, and agility training, has enabled the team to get stronger and feel more confident coming into the season. Kovach, a former assistant coach at Connecticut College takes over in place of 4-year assistant Zach Ward. At Connecticut, he helped lead the Camels to a 19-9-5 record and their first NCAA Division III tournament berth since 1995. Gettysburg returns 11 players who started a game last year, including four All-Centennial Conference selections, and all-region selection Ezekiel Omosanya. The Bullets will open regular season action against Whitworth on Aug. 31.